Sundays in Germany are unlike in the U.S. Everything is closed in Germany. It is a tradition that lives on, although many say it’s fading and won’t last. People are everywhere on Sundays though, they walk, bike, relax, window shop for when the stores are open. I have even seen a furniture store advertise that it was open, but only for viewing their items- It’s illegal to sell things. I got up around 9 and made a plan to go running. I couldn’t sleep past 10 even if I wanted to because the church bells outside my window ring for a good thirty minutes. 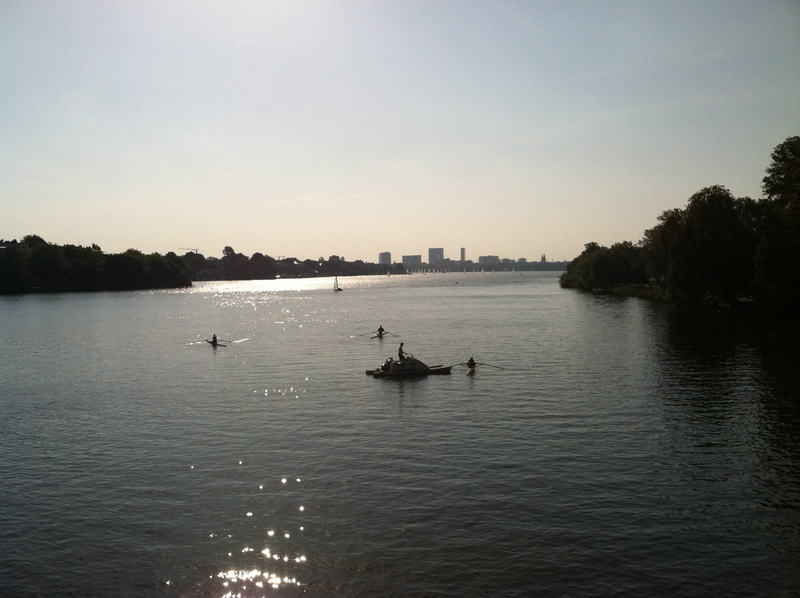 I took the bus the 3 kilometers into the city to the Alster, a river that has been dammed into a lake, and started the 7k run around the perimeter. At 10 there were a decent amount of people, but as it got later, more and more and more walkers, joggers, and bikers piled onto the path. It was incredible. I stopped (more than I would have liked to, training-wise,) to take some photos and got very excited to come back with my real camera to get some great shots. After spending two hours around the lake and the city, I have a great appreciation for it and hope to be rowing and sailing on it at some point this year.